It started with a McDonald’s breakfast sandwich at 11:05 which they reluctantly served us since we were a few minutes late. “It depends what you want,” the man said. “Egg mcmuffin,” being our simple answer. We then landed with the gear of one guitar, one music stand and one song binder at the Moonshine Cafe in Oakville to gather up, get our wristbands, and load onto the bright yellow bus. This magic bus brought us each a can of beer for the chilly ride along the qew to end up on the danforth, in front of the Black Swan. 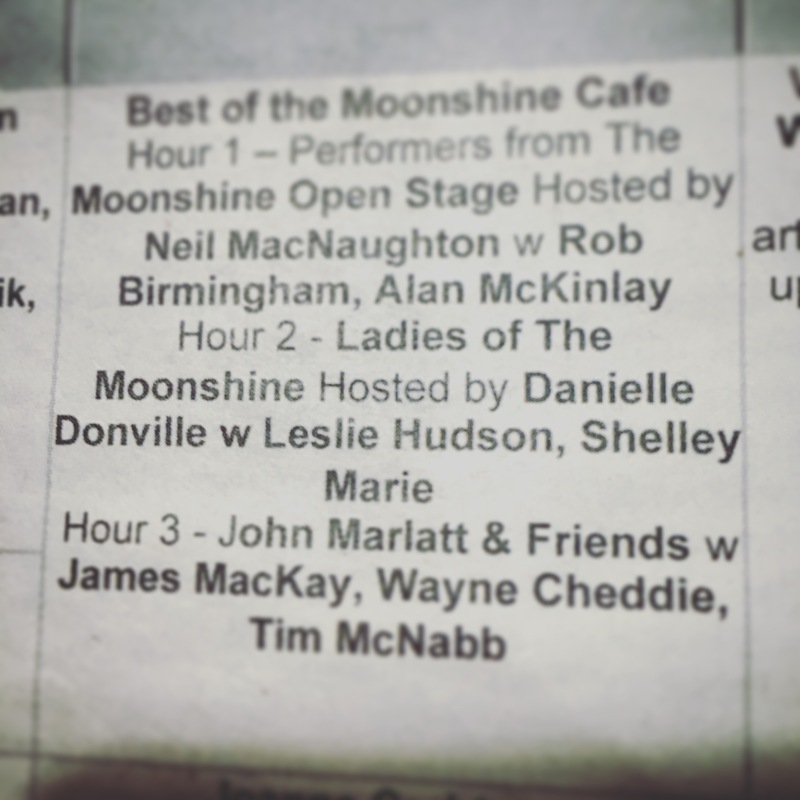 Firstly, the men of the moonshine open stage took to, well, the stage, and blessed us with everything from love ballads to ditties about Canadian Tire. Then Daniel tickled the ivories with some beautiful sounds – particularly Little Hands about his son growing up to be a man. Then it was our turn – the ladies of the Moonshine. I played alongside Danielle Donville, who hosted, and Meghan Boni with her banjo, and Leslie Hudson on keys and powerhouse vocals. I did 3 original songs, all of which can be found currently on SoundCloud- http://www.soundcloud.com/Shelley-Budd the experience of being on stage is a lovely one, especially when you perform “in the round” like we did, where one performer does a song and the next and it rotates around like so. My songs were Move – about wanting to make something happen, Sweet Oasis – about finding solace after something bad goes down, and Just Like Me – the song that at first makes me sound like a stalker, but is really something for a lost or lonely friend. We were followed by a few more moonshiners, and then the wind took us across the danforth to a couple of Irish pubs, where people bubbled between the two, one with a lovely girl singing with two burly men. And we took over a little room glassed in at the front of one pub, loudly making merry of the day. We got a math lesson from Paul. All in all it was great, finished with some squash soup (served by a waiter with a terrible attitude and even stupider hair) but the soup was delish and we all enjoyed eating except Shane whose wings arrived 20 minutes late. Thanks to Winterfolk for having us, and John and Jane for organizing it – what a nice day.